Label makers are used to create a large array of labels for many different things such as product labeling, file management, marking clothing and belongings, labeling drawers and cabinets and much more. With all of the choices available you may be wondering how you can determine which one is the right one for your particular needs. With all of the different styles and choices of label makers on the market you may not know how to tell one from another. 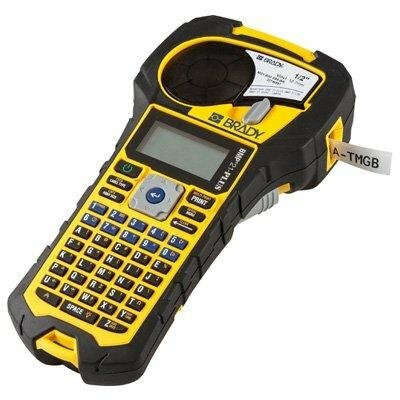 We’ve included three of the top rated label makers on t he market today. We’ll tell you what customers love about them, list their features and benefits and much more. Choosing a label maker after reading these reviews and guide will be simple. The purpose of these reviews of the top rated label makers available is to introduce you to the models and styles that are customer favorites. We’ll include the features these label makers have as well as give you information about why they are customer favorites. With this information you will be able to look at all of the different models and styles and look at your personal needs and match them up together with the perfect label maker. The unit is made strong and durable with heavy duty molded rubber impact bumpers, comes with an optional hard case and is drop tested to MIL drop-test standards. Other features include a backlit display so you can read the display even in lowlight conditions, a one-touch setup for several apps including aire, flagging, T-block, patchpanel and breaker box and contains 125 symbols for datacom, A/V, smart home, safety and electrical. Included are the letters A-Z and numbers 0-9. Text is printed in one color and you have a choice of 6 font sizes ranging from 6 to 40 points. Other terrific features are a built-in label grabber that keeps your label in place after it’s cut so it doesn’t just fall onto the floor, a one-handed label cutting feature that allows you to operate the cutter easily with one hand, an optional magnet accessory that allows the label maker to be mounted to a metal surface so your hands are left free to do other tasks. The super tough adhesive works well on rough and irregular surfaces as well as smooth surfaces. You will need 6 – AA batteries or can work with the optional rechargeable Li-ION battery or the optional AC adapter. Consumers who purchase the Brady BMP 21 plus label maker will have a 2 year limited warranty for additional peace of mind that the company stands behind their products. The DYMO LabelManager 420P provides the user with durable, water resistant labels that can be put on files, charts, tools, cabinets, belongings and more. The unit is very compact making it easily portable to wherever you need to make labels. The large keyboard makes typing super easy and the backlit display shows the style and content of the label before it is printed so corrections, if needed, can be made before printing. The LabelManager 420P connects to a PC or Mac with a USB cable that is included with the label maker that allows the user to have access to additional font styles, graphics and barcodes. With the rechargeable battery pack, large display that is backlit for lowlight conditions, quick accessibility to keys, fonts and different text effects you can create labels anywhere you need to go. This label maker has the ability to have personal graphics or even their logo on their labels thanks to this customization capability. There are additionally over 200 symbols and clip art images too. 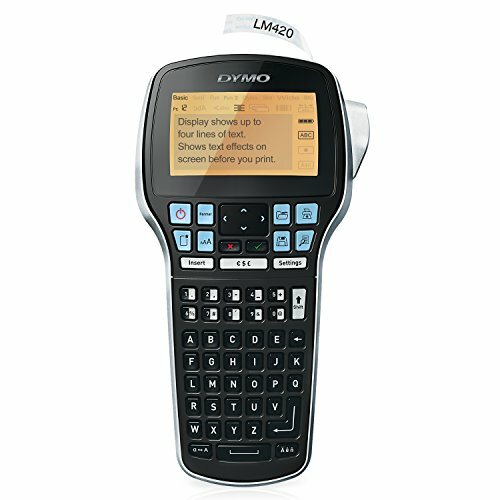 The DYMO label maker can store up to 15 labels that you use frequently so you don’t have to re-input the information every time. It can print up to 10 of the same label at a time. If you’re looking for a fast and easy way to create a large array of professional labels that have a lot of variety and are long lasting, the Brother Printer PTD600 Connectible Label Maker may be just what you’ve been looking for. The unit is compact and can be easily carried around in your hand and connects to a computer (windows or Mac) to be used with the P-touch Editor Label Design software that is free for users to work with. The color backlit display makes reading the text being entered easy, even in low light conditions. The easy to use QWERTY keyboard makes typing simple and efficient. It has large keys and an angled design that is very user friendly and comfortable to use. The fast print speed and auto tape cutter makes it the perfect choice for large labeling jobs as well. The full color backlit display automatically detects the color of the label you have chosen so you have a WYSIWYG label design unit that updates the text in real time as you type. With the ability to connect to a computer, you will be able to create a huge variety of labels that are sure to impress. The large library of label templates, fonts, symbols and graphics provide the ability to create labels that are truly unique and creative. You will even be able to print professional bar codes and company logos too. Label size capability is up to 24mm wide, almost a full inch, and you will have access to 11 different fonts, 99 frames, and a whopping 600 symbols to create with. You can save up to 99 labels for repeat use and easily reprint more of them with a few button touches. 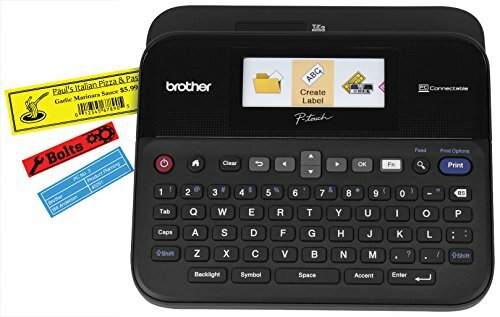 The Brother Printer PTD600 PC Connectible Label Maker is powered by 6 AA batteries that are sold separately or you can choose the included AC adapter giving you the option of making labels at the desk or anywhere you need to go. The TZe tape is protected by clean thin film and is resistant to water, grease, abrasion, fading, heat and cold. This makes the labels good for indoor/outdoor use. Application is easy with the split back design. Users can choose to use a specialty tape that can create flexible cable and wire labels for identification or you can create acid-free adhesive labels that will work for scrapbooks and other photo sensitive materials. The even have non-laminated fabric tape that is iron on for labeling clothing and other things. All three of these top rated label makers have the needed features and performance that people are looking for. Part of being able to choose the right product is having the right information that will enable you to effectively compare them to other models you may be interested in. We’ve reviewed these top rated models so you can decide if any one of them matches what your label needs are. If you want to look around some more, read this buyer’s guide and learn more information about label makers that will help you decide which ones are better for your needs than others. When you have the right tools, sorting through numerous choices isn’t scary or confusing and you can be confident that your decision will be a good one. A label maker is a device that allows a user to create labels for many different types of things. They can make labels for identifying clothing, children’s items, personal belongings, cabinets and drawers, product labeling, barcodes, and much, much more. They are used in all kinds of companies, restaurants, offices, schools and in homes for personal use too. They come in many different sizes and have numerous features that increase their value. The idea when searching through the different models available is to find the models that fit your specific needs. A school may have different labeling needs than an office. The first step in sorting through all of your choices is to know exactly what your needs are. There are a few different questions you need to ask yourself before you start searching for the right label maker for your needs. These questions will help you narrow down the choices and make it much more apparent which models will work for you. What kind of label material do you need – There are many different kinds of label materials available. The type of material you need for your labels will depend on what you are doing with them. Some may be perfect for resisting grease and water and can handle different temperatures. Then there are types that are on non-glossy paper that work great for files. The different labeling jobs you have make a difference as to the kinds of materials you need. The label maker you choose needs to be able to accommodate those needs and offer a variety of label materials. How wide do you need your labels to be? – If you are labeling something like a CD case, the very narrow 3.5mm label will be perfect but you also may need labels for name tags or that allow for several lines of text. There are many different widths and styles of labels available. Look for a label maker that has a variety of width choices for the user for extra versatility. Do you have a keyboard preference? – There are a few different styles of keyboard available on your label maker. Sometimes you may prefer QWERTY keyboard and other times a simple alphabetical design is just fine. The type of keyboard you choose is largely up to personal preference. There are many different features that a label maker may offer. Not all of them have the same features, but if you are looking for a good versatile label maker that can be used for a multitude of label making jobs, look for models that have the following features. A large variety of font sizes and text styles – Depending on the model, some label makers can even make decorative borders and print clip art and icons too. If you don’t need anything but a standard label, then buying one with tons of fonts and graphic capabilities is a waste, but for those label jobs that require versatility, finding a label maker that offers a lot of different label styles will be very valuable. AC Adapter or Rechargeable Batteries – You can save money by using the AC adapter or by using rechargeable batteries. The downside of using batteries is that if you use the label maker often, you will go through batteries quickly. Backlit Display Screen – Many screens have large displays that are backlit. This is very beneficial so you can see a preview of the label you are creating before you print it. You can see in lowlight conditions as well. Memory Storage – Many label makers have the ability to save frequently used label styles. If there are specific labels that you will be using repeatedly, make sure that the label maker you purchase has the ability to save many different styles of labels so you do not have to re-create them every time you want to use them. Automatic Label Cutter – This is a very convenient and useful feature that makes label making much easier, especially if you are doing a large labeling job. An automatic label cutter will automatically cut the label as soon as it is created, making it ready to peel and adhere. Thermal Printing – The old fashioned method of label making involved embossing methods that could be slow to create and awkward. Now there is thermal printing which is faster, easier and longer lasting. Automatic Shut Off – A good feature to look for is automatic shut off. This feature typically cuts the label masker off after it has been inactive for 15 or more seconds. This saves battery life for the label maskers that are only use batteries and can reduce the amount of energy used as well. PC Compatible – Another popular feature is the ability to connect the label maker to a laptop or PC so you can edit your labels, add even more choices of fonts and styles and in general spice things up more to meet your needs. For those models that have this feature, a USB cord will come with the label maker. When it comes to choosing a well made and versatile label maker, you have the tools to decipher which models are best suited to your jobs, information and knowledge is everything. This buyer’s guide and the reviews of the top rated label makers available, you are equipped with the tools and knowledge that prevent accidentally buying the wrong item and having to exchange it or get a refund, neither of which are always an easy process. Label makers are truly valuable tools for schools, offices, restaurants and other places of business for keeping things organized and easy to find. They are even good for home use for the same reason. Purchase a good quality label maker and there will be no need to guess where certain things are, you’ll have it organized and ready. Sincere there are so many different models of label makers on the market, you need knowledge and information that will help you understand these convenient pieces of equipment. It is our goal that you get the information you need from our reviews and buyers guide.